What does a cell feel? This is a common question, that breaks down once we think about cells growing in a 3D fibrous matrix. The video below shows human umbilical vein endothelial cells (HUVEC) spontaneously forming a capillary within a fibrin matrix, in 3D. The beautiful images are acquired by reflection mode of our laser scanning confocal microscope. We encourage anyone working with 3D tissue culture to image in the modality. It is revealing and label free. When watching the video note the transient deformations of the fibrous extracellular matrix resulting from contraction of the leading, or tip cell or the growing vessel. Also note the thin extensions transiently projecting from the cell to probe individual fibers. What are these cells doing? We are happy to report that we have no idea. Now consider a similar culture system in which we embed a dispersion of micro beads. The video below shows a capillary in fibrin with a single microbead exhibiting a gorgeous diffraction pattern visible in this reflection mode of imaging (you have to search for the bead. It appears as a circle surround by concentric diffraction rings. If the capillary points to ‘twelve o-clock’, then the bead is near the tip of capillary, at 9:00). If you look carefully you can see the cell pluck a single fiber in front of the capillary (at time = 15 sec). Our lab uses optical tweezers to wiggle such beads and determine the mechanical properties of the extracellular matrix nearby. What is an optical tweezer? It is a bit like a very tiny tractor beam, that draws the microbead into the center of a focused laser beam, termed the optical trap. The video below shows a microbead dragged through water by an optical trap , as we steer the focused laser beam at a rate of 40 times per second. Try doing that with a beach ball in the swimming pool!!!!! The Botvinick lab utilizes a sophisticated technique that we refer to as optical microrheology (MR). MR interrogates the local viscoelastic properties of 3D ECMs. Importantly, while many studies have correlated changes in cell phenotype with bulk material properties, there remains a critical need to quantify the local mechanical microenvironment on a length scale relevant for cells and their adhesive complexes, and to make such measurements in 3-D culture systems. MR has two major modes of operations: passive and active. In passive microrheology (PMR), the thermal motion of microbeads is analyzed to estimate local fluidity and pore geometry. In active microrheology (AMR), microspheres are forcefully oscillated by laser tweezers to measure the local shear modulus, a measure of stiffness. We have utilized MR within transparent hydrogels such as collagen, fibrin, PEG-fibrinogen, and reconstituted basement membranes (rBM, Matrigel). We constructed a laser tweezers apparatus to perform PMR and AMR, as diagramed below. The system combines a 1064 nm trapping beam with a low power 785 nm detection beam. In PMR only the detection beam is utilized. The beams are focused by a 60X 1.45 NA objective onto a microsphere. The microsphere acts as a small lens that steers the detection beam as it oscillates. 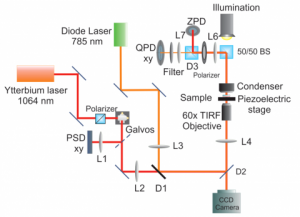 The deflected light is collected by the microscope condenser and imaged (in the Fourier plane) onto a quadrant photodiode (QPD). By careful calibration, we can relate QPD signals to positions of the microsphere and thus reconstruct the transverse wanderings of the microsphere . The complex shear modulus G*, which includes a measure of local stiffness, can then be calculated from the QPD signals [2, 3]. We find that PMR underestimates the stiffness of the ECM by orders of magnitude as compared to AMR and parallel plate rheology. Accordingly, our group exclusively uses AMR for the study of ECM stiffness. In AMR, the position of the trapping beam is oscillated by galvanometers (Galvos). After being steered by the Galvos, the trapping beam is sampled by a position sensitive diode (PSD) whose analog output is proportional to the position of the beam. As a microsphere is forced to oscillate under influence of the oscillating trapping beam, the local matrix resists the sphere’s oscillation through both elastic storage and viscous dissipation. As a result, the amplitude and phase of the sphere’s oscillation is modulated with respect to the oscillating laser trap. As with PMR, the low power detection laser is steered by the sphere and detected by the QPD. Analysis of PSD and QPD signals allows calculation of the complex shear modulus G = G’ + iG’’, where G’ and G’’ represent the elastic and dissipative moduli, respectively, of the ECM surrounding the sphere. 1. Kotlarchyk, M.A., E.B. Botvinick, and A.J. Putnam, Characterization of hydrogel microstructure using laser tweezers particle tracking and confocal reflection imaging. Journal of Physics: Condensed Matter, 2010. 22(19): p. 194121. 2. Buchanan, M., et al., High-frequency microrheology of wormlike micelles. Physical Review E, 2005. 72(1): p. 011504. 3. Mizuno, D., et al., Active and Passive Microrheology in Equilibrium and Nonequilibrium Systems. Macromolecules, 2008. 41(19): p. 7194-7202.